Ten years after the global financial crisis and four years since the launch of the European Banking Union, progress in stabilising the banking system, reducing the sovereign-bank nexus and deepening financial integration is slow. Mechanisms that exacerbated the previous crisis still seem to be in effect. The reactions on capital markets in the context of the government formation and budget negotiations in Italy make it clear that the European Monetary Union remains fragile. This means that further financial market reforms are essential. However, they require that no government calls into question the membership in the monetary union or its rules. In particular, the sovereign-bank nexus has to be loosened. For this to happen, an end needs to be put to the regulatory privileging of sovereign exposures, for example by applying risk-adjusted large exposure limits with risk-adequate capital requirements, or concentration charges. The latter should take the credit risk of sovereign debtors into account to avoid negative incentive effects. Well-diversified portfolios could be exempted from regulation up to a certain threshold in order to mitigate competition effects. However, this could raise contagion risks due to increased holdings of foreign government bonds. The introduction of a fiscal backstop to the Single Resolution Fund is reasonable. However, it should not be used to rescue banks through the back door. Mechanisms to provide liquidity to banks in resolution should also be considered. A common deposit insurance scheme could be useful, provided it is designed in an incentive-compatible way, such as in the form of a reinsurance scheme with bank- and country-specific premiums. However, removing regulatory privileges of sovereign exposures is a necessary prerequisite. In addition, further steps to reduce risks are needed. Removing the obstacles to financial integration in Europe is an important longer-term goal to improve risk sharing across national borders. The Banking Union has the potential to make a key contribution to improved integration of European banking markets. Obstacles to integration that make cross-border mergers unnecessarily difficult should also be removed. Harmonising regulation and supervision to a greater extent by reducing national options is a particularly important aspect. The Capital Markets Union is a key complement to Banking Union, to foster development and integration of European capital markets and reduce the high dependency of European businesses on banks. The focus should be on reinforcing resilient forms of financing, primarily in the form of equity. The key elements of promoting the development of an integrated capital market are harmonising insolvency law to a certain extent and providing for an equal tax treatment of debt and equity. Moreover, the competencies assigned to the European Securities and Markets Authority (ESMA) should be expanded. Finally, measures should be taken to increase the supply of capital, such as by strengthening private and occupational pension systems and improving financial literacy. (471) Establishing a Banking and a Capital Markets Union are key responses to the weaknesses in the euro area’s architecture revealed in the global financial crisis and the ensuing euro area crisis. However, ten years after the global financial crisis and four years since the launch of the Banking Union, progress in stabilising the banking system, reducing the sovereign-bank nexus and deepening financial integration is slow. (472) Mechanisms that exacerbated the previous crisis still seem to be in effect. A new sovereign debt crisis would thus likely have a serious impact on the domestic banking system of the country concerned. This would in turn place considerable strain on its domestic economy, as the European financial system remains heavily bank-based, and cross-border lending is low. Given the great importance of financial markets, additional steps to deepen the Banking Union would be necessary for the long-term stability of the monetary union. However, this would not work if any government called into question the country's membership in the monetary union or its rules. The reactions on capital markets in the context of Italy's government formation and budget negotiations make it clear that the markets do not completely trust Italy's commitment to being a member of the euro area. (473) The governments agreed to the introduction of a fiscal backstop to the Single Resolution Fund (SRF) at the Euro Summit of EU leaders in June, as well as to a further reduction of risks in the banking system (Council of the European Union, 2018). Negotiations on a European Deposit Insurance Scheme (EDIS), the third pillar of Banking Union, are also set to begin. The decisions regarding details were postponed until the December summit. In any case, short-term progress is unlikely due to protracted negotiations and to the long planned transition periods. (474) However, a vital element is missing from the negotiations, which is key to the long-term stability of the monetary union. There should be an end to the regulatory privileging of sovereign exposures in order to further loosen the sovereign-bank nexus. In addition, existing non-performing loans (NPLs) should be scaled back more quickly to accelerate further reform action, such as the fiscal backstop for the Single Resolution Fund, and to stabilise the banking system in a credible manner. A common deposit insurance scheme could be considered, provided it is structured in an incentive-compatible way. However, this requires other reforms to be implemented, in particular the removal of regulatory privileges for sovereign exposures, and additional steps to reduce risk. The faster the progress, the better the chances of agreement on establishing the common deposit insurance scheme. (475) Removing the obstacles to financial integration in Europe is an important longer-term goal to enable better risk sharing via credit and capital markets. Given that financing is still heavily bank-based, a common banking market would play a particularly important role. The Banking Union is key to strengthening the integration of the European banking markets. It is also important to remove obstacles to integration that make cross-border bank mergers unnecessarily difficult. (476) The Capital Markets Union is a key complement to Banking Union, to foster the development and integration of European capital markets and reduce the dependency of businesses on bank financing. This involves in particular a reinforcement of resilient forms of financing, primarily in the form of equity. The key elements driving the development of an integrated capital market are harmonising insolvency law to a certain extent and providing for an equal tax treatment of debt and equity. Moreover, the competencies assigned to the European Securities and Markets Authority (ESMA) should be expanded. It would also be reasonable to take measures increasing the supply of capital, such as by strengthening private and occupational pension systems and improving financial literacy. (477) The years following the global financial crisis and the crisis in the euro area gave rise to new regulations and institutional reforms, particularly the Basel III accord finalised at the end of last year after tough negotiations, and the European Banking Union, which was established with the Single Supervisory Mechanism (SSM) in 2014 and further strengthened in 2016 with the Single Resolution Mechanism (SRM). The Capital Markets Union project was also initiated. The central objectives of these reforms are to make the banking sector more resilient, loosen the sovereign-bank nexus and create an integrated European banking and capital market. (478) The considerable progress made in terms of the legal framework has been accompanied by comparatively little progress in achieving these objectives. Although bank capital ratios have risen significantly compared to the period before the financial crisis, this is partly because of a considerable decline in risk provisions. This could be the result of an overly optimistic risk assessment due to the positive economic performance and sustained low-interest rate environment (Deutsche Bundesbank, 2017), meaning that non-risk-weighted capital ratios, in particular, may still be too low to ensure banks' resilience. (479) Financial integration in the euro area increased strongly until the financial crisis, after which it noticeably decreased until the peak of the euro area crisis. Both price- and quantity-based indicators have risen again since 2012, although the quantity-based indicators have recently declined somewhat. Chart 63 The euro area financial system, at the same time, remains heavily bank-based, with a high degree of heterogeneity across the euro area countries (GCEE Annual Report 2015 items 440 ff.). (480) The limited progress after the crisis may imply that the efficiency potential from financial integration is not sufficiently utilised. ItemS 525 ff. In addition, it gives rise to stability risks, as reflected in the increase in risk premiums as a reaction to the government formation and budget negotiations in Italy. Box 10 The events there show, firstly, that redenomination risk (i.e., the risk of a country exiting the euro area) persists, and secondly, that risks may spill over to other euro area countries and banks. Hence, the European Monetary Union remains fragile despite reforms. This underscores the urgency of further reforms – firstly, a completion of Banking Union, and secondly, stronger integration of financial markets through the Capital Markets Union. Italy's economic development has been characterised for years by high government debt, low economic growth and relatively high unemployment. Item 254table 3 Italy's general election on 4 March 2018 resulted in protracted negotiations on forming a new government. The announcement on 16 May 2018 of a draft government programme for the coalition between the right-wing populist party Lega Nord and the left-wing populist Five Star Movement set off considerable disruption as it contained demands for the ECB to cancel Italian debt and hints of a possible exit from the euro. Spreads on Italian government bonds surged by some 150 basis points from 15 to 29 May 2018. There were likely two causes for this. Firstly, the coalition plan raised doubts about debt sustainability. And secondly, the redenomination risk, i.e., the risk of Italy leaving the euro area, seems to have increased. Gros (2018) demonstrates, based on an analysis of CDS contracts on Italian government debt that explicitly take into account redenomination risk (ISDA 2014), that the risk of Italy leaving the euro area accounts for around fifty percent of the increase in spreads from May till mid-July. Interest rate spreads of other member states increased during the same period. Particularly those countries with high public debt ratios such as Greece, Portugal and Spain recorded major increases, while less indebted countries such as the Netherlands, Finland and Austria reported smaller increases. Chart 64 (-3) It is thus possible that risk was transmitted to fiscally weak countries between 15 and 29 May. Moreover, a considerable rise was noted during this period in CDS spreads for European banks outside Italy; this increase was particularly high for those banks with low tier 1 capital ratios. Chart 64 (-4) While sovereign spreads of other member states quickly moved back to previous levels, this happened to a lesser extent for the banks' CDS spreads. A marked increase in spreads of Italian government bonds and CDS spreads of Italian banks was reported again at the end of September. Chart 64 (-1/-2) This was likely due to news about the ongoing budget negotiations. On 27 September, the Italian coalition announced its targeted budget deficit of 2.4 % of GDP for 2019, resulting in planned net borrowing below the three-percent-deficit threshold but considerably higher than the previous government had promised. On 15 October, Italy submitted its 2019 draft budget to the European Commission. Rating agency Moody's reduced Italy's sovereign debt rating by one notch to Baa3 on 19 October, citing the country's budget plans as main reason. The European Commission officially rejected Italy's budget plans on 23 October, and requested that the government should present a new draft budget within three weeks. In contrast to May, spreads of other member states and CDS spreads of non-Italian banks hardly reacted to Italian events this time. Chart 64 (-1/-2) Risk appears to have spilled over much less, if at all, to other member states and non-Italian banks. These developments indicate overall that market discipline on Europe's financial markets works. It is even likely its effectiveness has increased, due not least to the tapering of the ECB's net bond purchases anticipated since spring 2018. Item 347 In addition, the ECB had stressed that its mandate is not to finance government deficits under all conditions, while also noting in reference to Italy that there was no indication of contagion effects (ECB, 2018b). Nevertheless, a high degree of uncertainty with regard to Italy continues to prevail, given the emerging dispute with the European Commission and persistent fears about the country's fiscal sustainability. The first key steps in the path towards the Banking Union have been taken with the Single Supervisory Mechanism and the Single Resolution Mechanism. The objective of severing the sovereign-bank nexus, however, has not been achieved because key elements are missing. These include, first and foremost, removing the regulatory privileges for sovereign exposures, a fiscal backstop to the Single Resolution Fund, and tackling obstacles to integration in the banking and capital markets. The creation of a common European Deposit Insurance Scheme (EDIS) is another element currently under discussion. The resulting default risks vary considerably from member state to member state. Chart 67 bottom While German banks have a high concentration in exposures to German local authorities, German government bonds have an AAA rating, whereas Italian and Portuguese government bonds have a rating of BBB and BBB‑, respectively. (484) Critics of the removal of privileges for sovereign exposures argue that domestic banks perform a crucial stabilising function in times of crisis, because they tend to step in as buyers precisely when other investors are on the retreat. The concern is that removing these privileges would destabilise the sovereign debt markets (Visco, 2016; Tabellini, 2018). Proponents of the idea, such as the German Council of Economic Experts, on the other hand, regard the use of domestic banks to stabilise the sovereign debt markets as problematic, because this reinforces the sovereign-bank nexus and makes restructuring government debt more difficult. 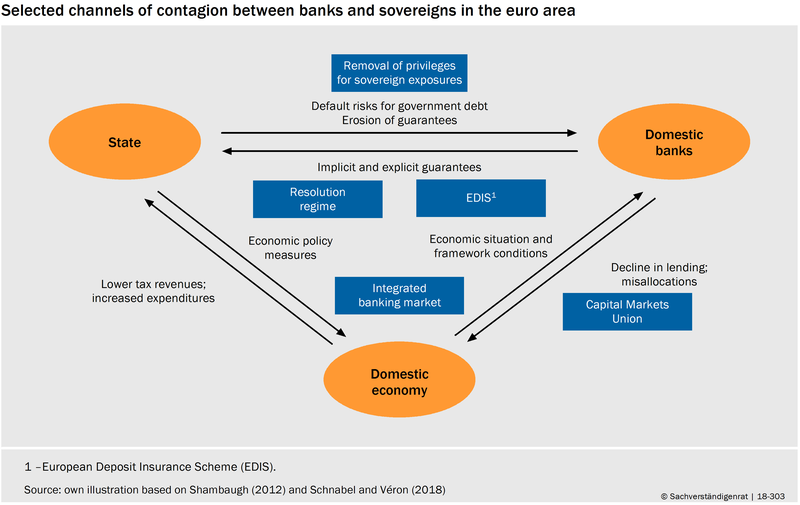 (485) The treatment of sovereign exposures in banking regulation is a particularly important aspect within a monetary union, because a sovereign debt crisis could have considerable contagion effects on other member states. Nevertheless, the removal of privileges for sovereign exposures in banking regulation is one of the most controversial topics in the context of the Banking Union. To date, policymakers have made virtually no serious efforts to address the lack of capital requirements and the high concentration of domestic government bonds in bank balance sheets. (486) While the European Systemic Risk Board (ESRB) had published a report on this issue in 2015, it did not set out any recommendations whatsoever regarding the treatment of sovereign exposures (ESRB, 2015). At the level of the Basel Committee, the issue was discussed in a working group set up in 2015. The final report published in December 2017 (BCBS, 2017) did not contain any recommended courses of action either, which makes it clear that no further initiatives along these lines are expected to emerge at international level in the near future. Although the European Commission’s roadmap mentions the regulatory treatment of sovereign exposures, it assigns a low priority to the matter, merely mentioning it among its potential future projects (European Commission, 2017a). There is virtually no other euro area member state in which the government is as closely entwined with banks as it is in Germany. In relation to own funds, German banks’ domestic sovereign exposures are among the highest in the euro area. Chart 66 This applies to large and regional institutions, and particularly to savings banks. Their sovereign exposures often correspond to well in excess of 25 % of own funds, and it is not uncommon to see this figure even go beyond the 100 % mark (GCEE Annual Report 2016 items 541 ff.). As for the country’s major banks, it is, once again, mainly the public-sector Landesbanken that tend to have a particularly high exposure to the German state. This shows the close link between state ownership of banks and credit relationships forged by sovereign exposures. At the same time, public ownership tends to be associated with higher implicit bail-out guarantees, which reinforces these ties even further (GCEE Annual Report 2016 chart 73 right). A substantial part of the rescue costs incurred in Germany as a result of the financial crisis was, in fact, attributable to the Landesbanken (Hellwig, 2018a). If we compare the current situation to 2007, the proportion of publicly owned banks has fallen from 45.8 % to 39.6 %, measured as the ratio of their total assets to the total assets of all banks, largely due to the problems encountered by the Landesbanken. However, this dwindling proportion of Landesbanken has been partially offset by market share gains by savings banks and development banks. The market share attributable to banks with special or development tasks rose from 10.6 % in December 2007 to 12.5 % in June 2016. Chart 68 The ranks of Germany’s twenty largest banks include twelve public-sector banks, four of which are development banks, with Kreditanstalt für Wiederaufbau (KfW) in third place. Unlike Landesbanken and savings banks, development banks continue to benefit from explicit support mechanisms provided by the Federal Government or the federal states (maintenance obligation, Anstaltslast). It is doubtful whether state intervention in the banking sector on this scale can be justified. State-owned banks can make a positive contribution to the stability of the banking system. Micco and Panizza (2006) and Brei and Schclarek (2013) illustrate the fact that public-sector bank lending is less pro-cyclical than private bank lending. This means that in an economic upswing, public-sector banks do not increase their lending volumes to the same extent as their private-sector counterparts, nor do they cut their lending volumes to the same extent during a recession. Coleman and Feler (2015) find that countries with a higher proportion of state-owned banks experienced a weaker recession after the Lehman Brothers collapse and made a faster recovery. Due to their incentive effects, however, government guarantees have implications for the stability of the financial system. Gropp et al. (2011) show that explicit or implicit guarantees, measured in terms of the likelihood of a bail-out, make competing banks more likely to take risks. Of those banks that are very likely to be bailed out, it is public-sector banks, in particular, that stand out on the basis of their increased risk appetite. The abolition of explicit guarantees for savings banks and Landesbanken in 2001, however, also resulted in the banks concerned taking greater risks. This can be attributed to the increased funding costs for Landesbanken and the resulting search for yield (Fischer et al., 2014), which even had an impact on the savings banks via lending relationships and ownership structures (Körner and Schnabel, 2013). (488) The proposals for the removal of privileges for sovereign exposures generally provide for limitations of concentration risks and improved loss absorption capacity by way of capital requirements. However, they vary in the weighting assigned to the two aspects, and in the extent to which the credit risk of sovereign debtors is taken into account. The proposals by Véron (2017) and Schneider and Steffen (2017) do not take the credit risk of the sovereign issuers into account. This harbours the risk of misaligned incentives as replacing exposures to relatively solid debtors with exposures to less solid debtors would become a more attractive prospect from the banks’ perspective. (489) One advantage of using concentration charges as opposed to large exposure limits would be the greater flexibility afforded to banks during the adjustment process, because banks would not be forced to comply with a hard limit for their exposures to individual governments. If banks wish to hold concentrated exposures towards individual governments, they can still do so as long as they comply with the corresponding capital requirements. This can help to avoid cliff effects. However, concentration charges should take debtors’ credit standing into account. As a result, it would make sense to expand the concept of concentration charges to make them dependent on the credit risk of the debtor in question. This would mean that higher risk weights would apply to concentrated exposures to countries with poorer ratings than to countries with better ratings. The implementation of risk-based concentration charges would reduce capital ratios considerably, both at banks with a high concentration of exposures to comparatively secure governments (e.g., German banks), and at banks with lower concentrations of exposures to governments with poorer ratings (e.g., Portuguese banks). The data from the European Banking Authority (EBA) Transparency Exercise 2017 is used to analyse the impact of risk-based concentration charges at bank and country level. Based on the proposal by Véron (2017), several alternatives are calculated that take the credit standing of the debtor nations into account. Table 18 It is important to remember that the sample only includes large banks that are generally classified as significant by the ECB and that it excludes development banks. The variants can now be used to calculate how they would impact banks’ tier 1 capital ratios if the banks were not to adjust their portfolios. Consequently, the results are to be interpreted as an upper limit, as it can be assumed that banks would adjust their portfolios in response to the regulation. This is, after all, what the regulations are designed to achieve. The unweighted averages at country level set out in Chart 69 show that the impact of the introduction of concentration charges and risk weights on banks’ capital ratios would vary considerably from member state to member state. The large exposures to German local authorities mean that the capital ratios of German banks would fall significantly. A system that takes credit risks into account would have much more of an impact on capital ratios, particularly in member states with a low rating. This reflects the higher risks associated with concentrated exposures to sovereigns with low credit standing. At the same time, it becomes clear that the calibration proposed by Véron (2017) would hardly increase banks’ risk absorption capacity, particularly in the former crisis countries. Given the limited effects, it is questionable whether, under this calibration, the desired incentives to promote greater diversification would be effective in these countries at all. (491) The calculations show that a pure concentration charge such as that proposed by Véron (2017) would primarily affect banks in Belgium, Germany and Slovenia, whereas the impact on the former crisis countries or Italy would be comparatively low. As a result, concentration charges would provide little incentive to reallocate exposures in those countries. It is not until credit standing is taken into account that concentration charges have noticeable effects in these countries. Belgian and German banks would be relatively hard hit by all of the possible variants due to their high concentrations. Banks in countries such as Cyprus and Greece would be hit the hardest by those options that take credit risk into account with a substantial weighting. Exempting exposures below 33 % of tier 1 capital (variants 1 and 2) would take significant pressure off banks. This would also create a clear incentive to hold diversified portfolios. (492) Every proposal aimed at improving diversification in bank sovereign exposures implies that German banks would have to invest more in claims towards other euro area countries, which would entail a higher default risk on average. Simulations performed by Brunnermeier et al. (2017) show that this risk could be avoided by creating a “safe asset” in the euro area that would provide not only for diversification but also for subordination (i.e., the assignment of seniority in the creditor hierarchy, in this case through tranching). This sort of security could be equipped with regulatory privileges. It would, however, have to be issued by private institutions and designed so as to avoid any implicit liability risk (GCEE Annual Report 2016 box 17). It is disputed whether this would be possible. Creating such an asset could help to prevent potential destabilising effects of the removal of privileges on the government debt markets. In any case, the removal of privileges for sovereign exposures would require long transition periods (GCEE Annual Report 2015 item 62). Grandfathering, for example, could initially be afforded to existing portfolios, meaning that concentration charges based on credit risk would only apply to new sovereign exposures. (493) There are two mechanisms that could result in concentration charges having a pro-cyclical effect. Firstly, bank capital could fall in the event of an economic downturn, increasing the capital requirements. This would force banks to reduce their sovereign exposures precisely at a time when they would be unable to increase their capital at short notice. Secondly, a downturn could have a negative impact on the credit standing of sovereign debtors, meaning that sovereign exposures would require greater capital backing. Whereas the first mechanism would come into play even if credit standing were left out of the equation, the second channel would only apply if the regulation explicitly includes the debtor’s credit standing. However, the pro-cyclical effect could be mitigated by applying average values for ratings and capital over a period of several years. (494) In lieu of ratings, alternative measures of the credit risk associated with sovereign exposures could be considered. A relatively straightforward approach could involve using the public debt ratio instead. This would have the advantage of enabling the continuous calibration of risk-based concentration charges, which could prevent discrete jumps in measured credit standing and, as a result, in the capital requirements (Schneider and Steffen, 2017). However, a low public debt ratio does not necessarily translate into a low credit risk, but could also be due to the fact that a country cannot take out any more debt. A high debt ratio, on the other hand, could suggest that market participants consider the country to have a high credit standing, meaning that they are prepared to offer it more funds. (495) The risks resulting from sovereign exposures would also have to be taken into account in internal models. The ESRB (2015), for example, discusses the introduction of lower limits for risk weights for sovereign exposures. Banks could also be required to comply with lower limits for default probabilities and loss given default. In this regard, it is worth remembering that banks that apply internal models can always use the standardised approach for sovereign exposures, meaning that the changes would have to be coordinated. Consequently, the most straightforward approach would be to abolish the use of internal models for sovereign exposures. This type of move is already being discussed, given the doubts as to the ability of internal models to adequately capture the risks associated with sovereign exposures (ESRB, 2015; BCBS, 2017). (496) Another open question is whether the regulations should be structured as a mandatory requirement (Pillar 1), a discretionary regulatory requirement (Pillar 2), or a pure transparency requirement (Pillar 3). As Pillar 1 requirements are binding for, and apply equally, to all banks, they would be the preferred approach from the perspective of the German Council of Economic Experts. Véron (2017) argues that a bank-specific approach in the context of the Supervisory Review and Evaluation Process (SREP, Pillar 2) is not sufficient in order to work against the concentration of sovereign domestic exposures. Whether disclosure obligations are a suitable way of resolving this problem is also questionable. Despite existing disclosure obligations, for instance as a result of the EBA measures, the concentration of sovereign domestic exposures has remained high. Transparency requirements, however, generally make sense as a supplementary measure in order to strengthen market discipline. (497) Finally, the removal of regulatory privileges affects other areas of regulation, too. The regulations governing liquidity currently give preferential treatment to sovereign exposures for the purposes of calculating the liquidity coverage ratio (LCR), because they belong to the category of the most liquid assets by definition, so the lowest haircuts are applied to them. The ESRB (2015) discusses a reform of the liquidity regulations to take market indicators into account when defining liquid assets. This proposal would also take into account the liquidity and credit risk associated with the assets in the calculation of the level of the haircuts applied. Similar discussions are expected in the context of the imminent implementation of the net stable funding ratio (NSFR). The calibration of the measures to remove privileges for sovereign exposures must also ensure consistency with the liquidity requirements. Risks from sovereign exposures could also be taken into account when calculating bank levies for the Single Resolution Fund and the premiums for a potential common European deposit guarantee scheme in order to give banks an incentive to reduce these holdings. Nevertheless, this is no substitute for the removal of privileges attached to sovereign exposures. (498) One of the council members, Peter Bofinger, does not agree with the demand to remove the regulatory privileges for sovereign exposures, e.g., through risk-adjusted large-exposure limits with risk-adequate regulatory capital requirements or through concentration charges. (499) Any removal of the privileges for government bonds and loans on the balance sheets of European banks would be detrimental to these banks’ competitiveness because no similar regulations are expected to be introduced outside the European Union (EU) in the foreseeable future. Regulatory capital requirements for government bonds and loans would make public-sector financing more expensive and thus make it more difficult for countries to reduce their government debt. (500) Removing the privileges would, in particular, go against the preferences of Germany’s banks and savings banks. It might force them to swap the bonds that they regard as completely safe, such as German bonds, for bonds from other member states that they rightly see as less safe. At the moment, there is not the least indication of a default risk on German government bonds in the decades to come that would justify introducing capital requirements or lending restrictions for such assets. (501) Upper limits on banks’ loans to governments and on the volume of government bonds that can be held on banks’ balance sheets are particularly problematic during a deep recession. If such limits were in place and a country’s banks had exhausted their leeway for government lending, a situation might arise in which it would no longer be possible to fund the deficits created by the automatic stabilisers. (502) A fiscal backstop to the Single Resolution Fund (SRF) is a necessary addition to the Single Resolution Mechanism. It is designed to stabilise the financial system when the SRF has insufficient funds (GCEE Annual Report 2017 item 115). The heads of state and government reached an agreement on the establishment of this type of backstop in the final statement on the Euro Summit held in June. The fiscal backstop is to be designed as a permanent credit line granted by the European Stability Mechanism (ESM) to the SRF and its amount is to correspond more or less to the fund volume. The loan repayments will be financed using additional future bank levies. A decision on the structure of the common backstop is on the agenda of the Euro Summit in December 2018. At the same time, the ESM direct bank recapitalisation instrument is to be abolished. (503) The Single Resolution Fund, which will not reach its target level until 2024, is designed to be used for resolution financing in cases where funds are required to support a smooth resolution process. The resolution instruments include the sale of the company to another institution, the creation of a bridge institution, the transfer of assets to an asset management company and the bail-in instrument. The Single Resolution Fund supports the use of these instruments in particular by guaranteeing the assets or liabilities of an institution in resolution or a bridge institution, granting loans, purchasing assets or providing capital for a bridge institution. The SRF target level corresponds to 1 % of the liabilities covered by the deposit guarantee scheme. If the SRF funds have been used up in full, the ESM credit line could presumably be used for similar purposes. This means that the fiscal backstop strengthens the clout of the Single Resolution Fund. (504) In principle, the liability cascade envisaged in the event of resolution remains unaffected, so the owners and creditors have to bear the losses according to their seniority (GCEE Annual Report 2014 items 331 ff.). The Bank Recovery and Resolution Directive does, however, allow for the use of the SRF funds to compensate creditors placed at a disadvantage as a result of the resolution process compared with standard insolvency proceedings, and also allows for payments to exempt certain creditor categories once a creditor bail-in corresponding to at least 8 % of the liabilities (including own funds) has been achieved (Deutsche Bundesbank, 2014). Consequently, it is at the discretion of the Single Resolution Board (SRB) to use the funds to protect individual creditor categories. The German Council of Economic Experts has already criticised the SRB’s considerable scope of discretion with regard to creditor bail-ins in the context of the SRF (GCEE Annual Report 2014 item 338). The same criticism can be levelled against the backstop. In particular, the concern is that the minimum requirement of a creditor bail-in of 8 % will be misunderstood as an upper limit, meaning that SRF funds will be used for any losses exceeding this threshold. This incentive could be enhanced even further by increasing available funds. This would violate the spirit of the new resolution regime. The probability of the fund and, as a result, the backstop being used, depends on the ability of the banks affected to absorb losses themselves. Therefore, the build-up of sufficient capital and bail-inable liabilities (MREL, TLAC) are a matter of fundamental importance. (505) There is also the danger of country-specific risks being mutualised through the Single Resolution Fund. This could occur, for example, if subordinated debt has been sold, with the acquiescence of national supervision, to retail customers who are supposed to be exempted from the bail-in at the cost of the SRF in the event of a resolution at European level. The bank levies for the SRF should therefore be designed so as to incorporate bank- and country-specific aspects. Making the premiums dependent on the scale of loss events in the relevant country could also be considered (experience rating). Finally, the introduction of the backstop is linked to sufficient risk reduction in the banking sector in order to prevent mutualisation of legacy debt through the backstop. Items 521 F.
(506) Governance of the fiscal backstop must, like the SRF itself, be democratically legitimised. However, it must also ensure the SRB can function and avoid lengthy delays so that a resolution procedure can be carried out over a weekend or even overnight (GCEE Annual Report 2014 items 323 ff.). Obtaining national parliamentary approval before using the backstop would therefore be impractical. Ideally, there should be an accelerated procedure as with the ESM. (507) The design of the Single Resolution Mechanism (SRM) gave special attention to restoring institutions’ solvency and neglected the provision of liquidity in the event of resolution. In reality, there is no guarantee that a resolution process to restore solvency will also safeguard an institution’s liquidity. This is especially true if, as in the case of the Spanish Banco Popular Español (hereinafter Banco Popular), the resolution is triggered by a liquidity shortage. Box 13 A lack of liquidity could jeopardise the success of a resolution. A resolution process must therefore safeguard not only the affected bank’s solvency, but also its liquidity. (508) In principle, the resources of the resolution fund can be used to provide liquidity. However, the fund is insufficient to cover more extensive liquidity requirements (Deslandes and Magnus, 2018). If the institution undergoing resolution still has sufficient collateral, provision of liquidity through the ECB is unproblematic as long as the resolution process restores the institution’s solvency. If the institution is taken over by another solvent institution, it can access liquidity through the latter. However, the question remains as to how liquidity supply can be ensured if an institution has neither sufficient collateral nor access to liquidity via another institution. In such cases, the institution is unlikely to be able to access liquidity on the interbank market either. (509) In this case, it could make sense to provide the bank with access, via the ECB, to a new special liquidity facility for banks in resolution, such as the “Eurosystem Resolution Liquidity” currently under discussion. Such facilities are already provided in the United Kingdom by the Bank of England and in the United States by the FDIC (Deslandes and Magnus, 2018). The risks from providing liquidity could be protected against by a default guarantee by the SRF to ensure that default risks are not borne by the central bank. In contrast, a guarantee by the affected member state would strengthen the sovereign-bank nexus rather than severing it. Liability on the part of the SRB would also ensure that the SRB is incentivised to take appropriate account of liquidity aspects in its decisions on resolution. Without a liquidity facility, the SRB could see itself forced to take inefficient resolution decisions. For instance, assets might be sold early to obtain liquidity even where it would make more sense to liquidate them slowly (Hellwig, 2018b). Moreover, resolution decisions would encourage takeovers by a larger institution as the best way to secure access to liquidity and avert the need for additional liquidity provision by the SRB. In the case of large banks, the resolution process could fail altogether if insufficient liquidity is made available. An alternative option that could be considered would be to increase the volumes of the SRF and backstop for the purposes of securing liquidity. (510) The case of Banco Popular shows, however, that the liquidity requirement in the event of resolution can be additionally reduced through a timely intervention by the supervisory and resolution authorities. Box 13 The SRB should play a more active role here than in the past and, where applicable, should itself declare institutions as “failing or likely to fail” (GCEE Annual Report 2017 item 440). The new liquidity facility should be designed such that the supervisory and resolution authorities have an interest in not delaying resolution. Ultimately, there is the question of why Banco Popular received emergency liquidity assistance (ELA) from the Spanish central bank only a short time before the resolution. This case thus invites a review of the ELA’s design. On 6 June 2017, the ECB declared the Spanish Banco Popular Español as “failing or likely to fail” (the following description is based on Mesnard et al. 2017). As justification, it cited a significant worsening of the liquidity position resulting from a depositor run that had been taking place for several weeks. The bank had received emergency liquidity assistance (ELA) from the Spanish central bank as recently as 5 June. On 6 June, a further application for ELA was declined due to the lack of collateral. Once it became clear that ELA could not restore the bank’s liquidity, the ECB classified the institution as at risk of failure. Given the bank’s systemic relevance and the associated public interest, a resolution procedure was initiated at European level. On 7 June 2017, the Single Resolution Board (SRB) took a resolution decision, which involved the sale of the company to Banco Santander for the price of one euro. This decision resulted in a full bail-in of equity and subordinated debt, which was sufficient in the SRB’s view to restore the bank’s solvency without drawing on public funds or the bank resolution fund. Due to the rapid overnight implementation of the resolution process, capital market disruptions were avoided (GCEE Annual Report 2017 items 431 ff.). Despite the seemingly smooth resolution, the process raises questions. High risks were already identifiable in 2016, yet the bank still “passed” the 2016 stress test. The bank reported heavy losses in 2016 and in the first quarter of 2017. Despite this, the resolution authority appears to have intervened relatively late, meaning that the resolution decision had to be made based on a provisional valuation of the bank. This estimated the bank’s capital at between +1.3 and –8.2 billion euros. The resolution decision was based on the “best estimate” of –2 billion euros (Hellwig, 2018b). Given that its insolvency could presumably have been anticipated at a much earlier stage, this raises the question as to why the bank was only considered at risk of resolution once it had run out of liquidity. The fact that deposits were being withdrawn for a period of several weeks, including in no small part by Spanish local authorities (Mesnard et al., 2017), suggests that depositors had doubts about the bank’s solvency long before the resolution process was initiated. Due to this run on deposits, Banco Popular had largely run out of liquidity by the time of resolution. Had it not been for the bank’s takeover by a larger institution with access to liquidity (Banco Santander), this would have been a serious problem. All in all, these events suggest that the ECB (as the responsible supervisory authority) and the SRB acted too late. The Spanish central bank’s provision of ELA to an insolvent bank should also be seen in a critical light. (511) In the agreement on the creation of a European Banking Union in 2012, the European Deposit Insurance Scheme (EDIS) was envisaged as one of its three pillars (European Commission, 2012). While the Single Supervisory Mechanism (SSM) and Single Resolution Mechanism (SRM) have come into effect in 2014 and 2016, respectively, no agreement has yet been reached on EDIS. The EDIS proposals published by the European Commission (European Commission, 2015a, 2017b), which provide for a fully mutualised European deposit insurance scheme, have met with criticism particularly in Germany, where it is feared that troubled banking systems in other member states could be rehabilitated through the deposit insurance scheme at the expense of German savers. According to the final statement of the Euro Summit, work will now begin on a roadmap for beginning political negotiations on EDIS (Council of the European Union, 2018), bearing in mind all elements of the roadmap from 2016 (Council of the European Union, 2016). (512) The central aim of a deposit guarantee scheme is to give depositors certainty of receiving their deposits back even in the event that their bank falls into difficulties. If the deposit guarantee scheme is credible, it can prevent bank runs by the insured depositors. Beyond the deposit guarantee scheme, the central bank in its function as lender of last resort plays the primary role in stabilising the banking system (GCEE Annual Report 2016 item 547). It can provide the necessary liquidity if a systemic crisis causes a run on the banks that even affects solvent banks (Bordo, 1990). (513) A country’s banks typically finance the deposit guarantee scheme by paying premiums based on their riskiness into a fund in advance. Additional contributions can also often be demanded ex post. Under the planned harmonisation of the national deposit guarantee schemes by the European Deposit Guarantee Schemes Directive (European Parliament and Council of the European Union, 2014), each fund is supposed to have a target volume of at least 0.8 % of the covered deposits by 3 July 2024. For France, a lower target level of 0.5 % was set for reasons that are hard to comprehend. The national funds are thus so small that they are only likely to be able to compensate depositors in the event of problems at smaller banks. In a systemic crisis, they cannot be expected to be able to meet the claims of depositors. The credibility of the deposit guarantee scheme in a systemic crisis therefore rests primarily on the implicit fiscal backstop by the banks’ host country. This reinforces the sovereign-bank nexus. For one thing, the safety of deposits and the credibility of the deposit guarantee scheme depend on the solvency and willingness to pay of the host country. For another, the occurrence of the insured event can have a negative impact on the country’s solvency. (514) Progress in the area of bank resolution is already helping to reduce the likelihood of the deposit guarantee scheme being drawn upon. When a bank is resolved, the owners and subordinated creditors are bailed in first. Depositors covered by the deposit guarantee scheme are generally exempted from the bail-in. The first €100,000 of their deposits per bank (covered deposits) do not contribute to meeting the costs of bank resolution. Should it be necessary to draw upon covered deposits in order to settle the losses of the bank being resolved, the deposit guarantee scheme is liable for this amount (Article 109 BRRD). A functioning resolution regime therefore protects the deposit guarantee scheme. This means that the national deposit guarantee scheme has an interest in a comprehensive creditor bail-in and should be actively involved in the resolution process. In addition, the deposit guarantee schemes can use their funds to prevent a bank from failing (Article 11 (3) of the European Deposit Guarantee Schemes Directive). (516) A common European deposit insurance scheme may be a suitable means of reducing the sovereign-bank nexus arising from the deposit guarantee. If risks are not perfectly correlated, the larger fund volume at European level could ensure better protection and reduce the necessity of making recourse to the member state. The credibility of the deposit guarantee scheme would therefore depend less on the solvency of the individual member state. The fact that more money would be available to protect deposits, however, is insufficient justification for the creation of a European deposit insurance scheme. A clear European interest, such as taking precautions against contagion effects, must be identifiable. With respect to the significant banks under SSM supervision at European level, EDIS could also contribute to the unity of liability and control. For instance, the costs of poor decisions by the common supervisor would then be borne at European level. Otherwise, spiralling restructuring costs driven by an overly lenient approach on the part of the SSM could unreasonably strain the national deposit guarantee schemes. (518) A common deposit insurance scheme also entails difficulties as, like any insurance scheme, it causes incentive problems. Many important economic policy decisions affecting bank stability will continue to be taken at national level. For example, member states could amend the foreclosure framework ex post (GCEE Annual Report 2016 item 549). Default risk increases if it becomes difficult for lending banks to realise collateral. A common deposit insurance scheme could thus create misaligned incentives for member states to shift risks to European level. The same risk exists if banks are allowed to have unlimited domestic sovereign exposures without appropriate regulation. This could transfer sovereign default risks to the common deposit insurance scheme. At the same time, banks could continue to hold a large amount of government bonds of their host country without facing higher risk premiums on deposits in return. Finally, existing risks and legacy issues could be mutualised through the deposit insurance scheme. This applies in particular to risks from non-performing loans. (520) According to simulations by Carmassi et al. (2018), there would be little cross-subsidisation between countries even in a fully mutualised system. This is firstly due to the greater loss absorption capacity of European banks thanks to higher capital and bail-inable debt. Secondly, the deposit insurance scheme is only drawn upon if the creditors more junior in the liability cascade have already been bailed in. This means that the probability of the deposit guarantee scheme being used is considerably lower than in the case of the Single Resolution Fund. This underscores that EDIS needs to be discussed in the context of the Single Resolution Fund, soon to be equipped with a fiscal backstop. This is particularly true given the SRB’s scope of discretion in activating the SRF. Items 504 F.
Thirdly, the use of risk-based premiums leads to higher contributions by banks from riskier countries. Despite the claims of this simulation study, however, this outcome could also be achieved in a reinsurance system provided it sets different target levels for the national deposit guarantee funds depending on the level of risk. A reinsurance system would be preferable on incentive grounds. The recently discussed reinsurance systems with fixed target volumes at national level, by contrast, would be counterproductive as the size of the national funds would not appropriately reflect the banks’ risks. (521) In the roadmap for the completion of Banking Union, further steps towards risk sharing – such as the fiscal backstop to the SRF or the common European deposit insurance scheme – are being made conditional on achievement of a significant reduction of risks in the financial sector in advance (European Commission, 2017a). This aims to prevent the risk-sharing mechanisms extending to risks that have already materialised in the past. For example, legacy portfolios of non-performing loans must be reduced, bail-inable liabilities must be increased (MREL, TLAC), and funds in the Single Resolution Fund and national deposit guarantee schemes must be accumulated to the target level. To provide a commitment effect on all sides, it would make sense to couple further steps towards risk sharing to the achievement of specific targets. (522) In implementing the SRF’s fiscal backstop, it is planned that the responsible authorities should present a report in 2020 on the reduction of NPLs and the creation of subordinated bail-in buffers, on which basis the decision on a possible early enactment will be made. Germany and France have proposed a reduction in non-performing loans to 5 % of total loans, and to 2.5 % after consideration of risk provisions (Federal Ministry of Finance, 2018). Ideally, the agreed targets should be fulfilled at individual bank level so that institutions making faster progress with reducing risks gain access to the risk-sharing mechanisms earlier than others. At least as important as reducing NPLs, however, are the rules for an appropriate risk provision for existing and future NPLs. Reforms of insolvency law, e.g., by creating faster out-of-court procedures, are also desirable and could accelerate the reduction of NPLs. (524) However, agreement is lacking thus far, especially on the regulatory treatment of banks’ sovereign exposures, which could indefinitely delay further steps towards completing the Banking Union. It would therefore be sensible to explore options for responding to concerns about a destabilisation of the sovereign debt markets, for instance by allowing for long transition periods. It would also be conceivable to initially limit EDIS access to banks that subject themselves to voluntary large exposure limits for sovereign exposures. (525) Free movement of capital is a core component of the European Single Market. The aim is for capital to flow smoothly across borders, leading to an efficient capital allocation. This enables smoothing of income and consumption through insurance against country-specific risks, for example through cross-border asset holdings and lending (Asdrubali et al., 1996; Asdrubali and Kim, 2004). This type of risk sharing is particularly important in a currency union. Here, there is no possibility of adjustment through the nominal exchange rate, so an important channel for absorbing country-specific shocks is unavailable. Items 406 ff. (526) The integration of financial markets in the euro area today is considerably below the level achieved before the global financial crisis. Chart 63 In particular, cross-border interbank business has declined and progress regarding the integration of capital markets is muted. Chart 72(-1) This points towards barriers to financial integration that have thus far been insufficiently addressed by the Banking Union and Capital Markets Union. Further steps are therefore required to reduce frictions and create a common capital market. This is particularly urgent in the context of the United Kingdom’s exit from the European Union, as British banks, financial service providers and stock exchanges play a prominent role in the European financial market. It cannot be ruled out that Brexit might have a detrimental impact on the availability and cost of financial services. Box 14 To counter this, obstacles to financial market integration across the remaining member states should be dismantled, especially within the euro area. (527) The literature on international risk sharing differentiates between various channels for the smoothing of income and consumption. They include the “factor income channel”, often referred to as the “capital channel” in the literature. This comprises factor incomes such as income from financial assets held abroad and from employment in other countries. The “savings channel”, frequently referred to as the “credit channel”, captures smoothing via national savings. In addition to domestic investments, it comprises private and public net borrowing. The “fiscal channel” consists of cross-border public transfers as well as private transfers such as remittances. The empirical literature on risk sharing in federal states highlights the great importance of the factor income channel, while risk sharing through fiscal transfers appears to play a relatively small role. For example, studies on the United States, Canada, Sweden and Germany show that the factor income channel makes the greatest contribution to risk sharing. Credit markets and national fiscal measures make a noticeable but considerably weaker contribution to smoothing consumption (Asdrubali et al., 1996; Andersson, 2008; Balli et al., 2012a; Hepp and von Hagen, 2013). (528) Analyses for the European Union or the euro area, on the other hand, show that the contribution of the factor income channel to risk sharing between the member states is relatively low compared to that seen in a federal state such as the United States (Sørensen and Yosha, 1998; Asdrubali and Kim, 2004; Kalemli-Özcan et al., 2005; Balli et al., 2012b; Kalemli-Özcan et al., 2014). Hoffmann et al. (2018) show that in the euro area prior to 2008, the interbank market was the primary contributor to the increase in financial integration. However, its collapse as a result of the financial crisis led to an appreciable decline in private risk sharing. Cross-border loans by banks to the private sector, meanwhile, had a comparatively strong influence on smoothing incomes and were more stable in times of crisis. An ECB analysis (2018a) based on the methodology of Asdrubali and Kim (2004) suggests that more than three quarters of shocks are not smoothed. The analysis shows that there was a certain degree of risk sharing through the factor income channel. According to this analysis, the savings channel, which also captures borrowing by governments from supranational institutions such as the EFSF and the ESM, seems to have overall negatively contributed to risk sharing. Milano (2017) and Cimadomo et al. (2018) examine the extent to which European institutions have contributed to increasing risk sharing in the euro area. Both studies show that the smoothing of country-specific shocks has increased since the creation of the EFSF and ESM. However, there still seems to be considerable potential for better risk sharing, especially in the case of risk sharing via capital and credit markets. These channels are largely uncontroversial and also reduce the necessity for fiscal transfers, which are prone to incentive problems. Items 449 ff. (529) Integrated financial markets contribute not only to risk sharing but also to reducing financing constraints (Bekaert et al., 2005; Giannetti and Ongena, 2009). They also allow for economies of scale, for instance by increasing liquidity and market depth. This is particularly relevant for smaller member states. Moreover, cross-border capital flows and especially foreign direct investments are associated with knowledge transfers (Borensztein et al., 1998) and greater competition, and can contribute to the development of the financial system. However, not all forms of financial integration are equally beneficial (Goldberg, 2007; Henry, 2007; GCEE Annual Report 2015 items 446 ff.). Empirical studies point in particular to the virtues of financial integration in the form of equity as opposed to debt (Henry, 2000; Bekaert et al., 2001; Kose et al., 2009). In times of financial crises, foreign direct and portfolio investments in the form of equity prove less volatile than portfolio investments in the form of debt or loans provided by banks (Becker et al., 2007). Debt can be pro-cyclical if bank runs or sudden stops exacerbate the impact of negative shocks. This applies in particular to short-term debt. Equity by contrast tends to have a stabilising effect as payoffs are state-contingent. (530) Greater financial integration can lead to new risks for financial stability because economies are more closely interlinked. This implies that crises can quickly spread to other countries through financial channels (Müller, 2006; Glasserman and Young, 2016). There is therefore a trade-off between the efficiency gains from greater financial integration and the possible risks to financial stability. This trade-off is manifested not least in the area of harmonisation because a system characterised by diversity may prove to be particularly resilient in a crisis. The ECB’s financial integration report (2016a) in fact points to an increase in cross-border holdings of equity in relation to debt. Chart 71 top For instance, the share of equity in portfolio investments has increased since 2009. The picture differs across euro area member states, however. In countries whose ratings have been substantially downgraded since the start of the financial crisis, the share of equity in portfolio investments is considerably lower (ECB, 2016a). Long-term debt has increased as a proportion of total foreign debt since 2008. Chart 71 bottom The same applies to the share of foreign direct investment in the euro area in total investment from abroad (ECB, 2018a). This points to a gradually increasing resilience of financial integration. (532) The economic policy objective cannot be maximum integration of financial markets. Instead, economic policy should concentrate on eliminating frictions, particularly in the areas where efficiency gains are to be expected, without threatening financial stability. Achieving this objective requires financial integration through resilient forms of financing and is an argument for strengthening equity financing and direct investment. (533) Given that financing in Europe is heavily bank-based, integration of the European banking market plays a particularly important role. Historically, the banking sectors in the EU member states have developed very differently. This is reflected, for example, in the great variety of market structures and business models as well as the different regulations. International regulatory agreements under the Basel Committee have resulted in a greater standardisation of banking regulation in Europe as, unlike in the United States for instance, the international regulatory requirements also apply to smaller banks. However, there are still differences in the national transposition of European requirements and in their implementation by national supervisors. The differences in national supervisory legislation are mainly attributable to the extensive use of options and national discretion. The European Banking Union has contributed to further standardisation. The significant financial institutions are subject to common supervision under the Single Supervisory Mechanism (SSM), which, however, must be based on national supervisory law including the national options. In addition, supervisory practice is to be further aligned using the Single Rulebook developed by the European Banking Authority (EBA) for institutions not directly supervised by the ECB. (534) Despite these efforts, the European banking markets remain highly segmented, particularly in retail banking. Only 1 % of household loans are granted across borders (ECB, 2018a). Cross-border bank loans to non-financial businesses in the euro area were trending upwards before the crisis, but have since stagnated at around 5 % of the total lending volume to such companies. A further 3 % involved EU countries outside the euro area. Chart 72(-3) Cross-border interbank loans used to be considerably higher but have declined appreciably since the crisis. Chart 72(-4) The business through foreign branches and subsidiaries has also been declining in the euro area since the euro-area crisis. Chart 72(-2) This is not least because policymakers and supervisors called on banks after the crisis to focus on their core business, which often meant withdrawing from other countries. (535) According to the ECB (2018a), based on the results of Giovannini et al. (2018), foreign branches and subsidiaries play a particularly important role in risk sharing via the savings channel. Schnabel and Seckinger (2018) show that the growth of manufacturing industries that rely more on external financing depended on the activities of foreign banks in the EU especially during the financial crisis. No such effects were found for cross-border lending. Efforts to reduce barriers should therefore give special attention to the business transacted through foreign branches and subsidiaries. Given the existing overcapacity in the banking sectors of many euro area member states, mergers represent the primary opportunity for market access. However, there have been barely any cross-border mergers in the banking sector since the financial crisis (ECB, 2017a). This is likely linked in no small part to the existing legacy assets in the European banking sector, such as the large portfolios of NPLs. National mergers, meanwhile, took place at several troubled banks last year (GCEE Annual Report 2017 items 432 ff.). (536) Moreover, cross-border mergers are hampered by politicians’ calls for a national industrial policy for the financial sector, which recently is being heard more frequently in Germany (Neubacher, 2018; Reuters, 2018). Political interference in corporate decisions, which promotes the creation of “national champions”, is to be viewed critically and involves the risk of inefficient bank mergers and an reinforcement of the “too-big-to-fail” problem (Monopolies Commission, 2004; Schnabel and Hakenes, 2006). Moreover, favouring national mergers contradicts the spirit of banking union. (537) Instead, barriers to cross-border mergers should be reduced (ECB, 2017a). Cutting back on national options in banking regulation would be expedient here, as would a greater standardisation in central areas of insolvency law and consumer protection. At the same time, it must be ensured that banks operating across borders within the euro area can be smoothly resolved without legal obstacles. Restricting the exchange of liquidity and capital between parent companies and subsidiaries (ring-fencing), as is common practice today, complicates resolution and makes cross-border mergers less attractive. If deposit guarantee schemes are organised at national level, a certain degree of shielding subsidiaries from liquidity and capital outflows is inevitable. In the medium term, however, a more flexible system for sharing liquidity and capital within banking groups (including MREL and TLAC) would be desirable. A deeper banking union would reduce the necessity for ring-fencing and could thus contribute to a stronger integration of banking markets. Items 481 ff. (538) The Capital Markets Union project, launched in 2014, is aimed at strengthening market-based financing as another option besides bank financing in the member states of the European Union, and to promote deeper financial integration (GCEE Annual Report 2015 item 437 ff.). To this end, the European Commission presented an action plan in 2015 with the aim of overcoming the obstacles to market-based financing in Europe (European Commission, 2015b, 2015c). As well as encouraging financing through capital markets in general, the plan focuses on particular market segments, such as the access to capital markets for small and medium-sized enterprises (SMEs), investment in long-term infrastructure and venture capital, private placements and securitisations (GCEE Annual Report 2015 box 15). Originally, the framework conditions for Capital Markets Union were to be in place by 2019. (539) Improved access to capital markets may prove beneficial for a variety of reasons. When companies have more diversified sources of funding, they are less dependent on the banking sector. This is especially important during a financial crisis (GCEE Annual Report 2015 box 16; Thomadakis, 2017). Gambacorta et al. (2014) show that countries with bank-based financial systems are hit particularly hard by recessions linked to a financial crisis. Improved access to market-based financing, moreover, can improve risk sharing among member states via the factor income and credit channels. Items 527 FF. Finally, high-risk companies may particularly benefit from improved access to the capital markets, which can offer not only improved start-up financing but also additional financing for companies in the growth phase. Insufficient financing for such companies is frequently cited as a reason why they do not base themselves in Europe (GCEE Annual Report 2015 items 690 ff.). (540) Following the Brexit vote, market-based financing is likely to take on a much more significant role in the remaining EU. Depending on the extent to which financial institutions based in the United Kingdom lose their passporting rights, capital market activity is expected to migrate to the remaining member states (Sapir et al., 2018). Box 14 Free movement of capital will become crucial, particularly if a system with multiple financial centres emerges. This underlines the necessity of eliminating the obstacles to cross-border capital flows. In terms of strengthening European financial integration, the Capital Markets Union complements the Banking Union. Items 481 FF. (541) Market-based financing still plays a subordinate role in Europe compared to the United States. Since the financial crisis, capital market financing has increased slightly in Europe but to a lesser degree than in the United States. Chart 73 top However, these changes are likely to be partly due to pricing effects on equities and bonds in the prevailing environment of low interest rates. The low level of supply in European capital markets may also be due to structural differences in the systems underpinning provisions for old age. In Germany, for example, pensions are mainly financed on a pay-as-you-go basis. By contrast, pensions in the United States are to a larger extent funded by capital, which explains the higher investment volumes and the greater relevance of institutional investors such as pension funds and asset managers. (543) On the demand side, information asymmetries can pose a significant challenge. The bulk of non-financial companies in the European Union are SMEs (Bremus and Neugebauer, 2018). These companies face structural obstacles when accessing capital markets because fulfilling the disclosure requirements involves a lot of effort. Moreover, the fixed costs for issuing securities are frequently prohibitively high. Many SMEs turn to banks for finance instead, but this is not an option for start-ups in their initial and growth phases because of the risk structure of their projects. In countries where the capital markets are poorly developed in terms of venture capital, new companies are less likely to be launched or they will relocate to another country. The problem with this is that start-ups are crucial to economic growth and innovation. (544) In Europe, equity finance is particularly poorly developed (Valiante, 2016). This is favoured by the structure of the tax system (Feld et al., 2013). Debt finance enjoys preferential tax treatment in most EU member states (European Commission, 2013; Bremus and Huber, 2016). This gives companies an incentive to take on excessive debt finance, which is likely to reinforce the trend towards bank financing (European Commission, 2015b; Bremus and Huber, 2016). (545) The aforementioned obstacles are even greater when it comes to cross-border financing. This might explain the low level of risk sharing via capital markets. Items 527 FF. Different withholding taxes in the member states may represent a barrier to the cross-border movement of capital for retail investors. Although most bilateral tax agreements provide for the reimbursement of withholding taxes in order to prevent double taxation, investors still have to follow complex procedures (European Commission, 2017c). Insufficient financial literacy also plays a central role in this context, because retail investors are often unaware of the advantages of international diversification (“home bias”, Coeurdacier and Rey, 2013; Harms et al., 2015) and useful cross-border investment opportunities go unused (European Commission, 2017c). For institutional investors, such as asset managers, barriers arise as a result of differing legislation and its application at member state level (European Commission, 2017c). Insolvency law, for example, differs from country to country and there are also huge discrepancies in the duration of foreclosure procedures. Both of these factors lead to a lack of legal certainty (European Commission, 2017c; GCEE Annual Report 2016 item 521). Barriers also exist in the form of different regulatory requirements in the member states, e.g., differences in sales regulations and consumer protection rules (European Commission, 2017c). Finally, SMEs find it even more difficult to obtain access to capital markets abroad than at home because information asymmetries are more pronounced at international level. Legal differences, e.g., in insolvency law, play an important role here as well. (546) The considerations set out above are supported by the empirical literature. The analysis by Giovannini et al. (2018) indicates that personal pension provision, financial literacy, insolvency law and the investment fund sector are particularly critical to international risk sharing in the euro area. Investment funds could promote financial integration, because they help to reduce the aforementioned obstacles by enabling international diversification at low cost. In fact, the volume of assets under management in investment funds has risen sharply since the financial crisis (GCEE Annual Report 2017 item 495). It can also be seen that when it comes to equities and bonds, funds have begun to focus more heavily on international securities. Chart 74 This is especially the case for non-European securities. In addition, within the European securities, there has been a shift towards non-domestic issuers. Given this trend, investment funds are likely to play an increasingly important role in intensifying the movement of capital in Europe, not least in the context of private and occupational pensions. Investment funds – in the form of credit funds – could also play a more important role when it comes to corporate finance in future. (547) The European Commission presented numerous measures and legislative proposals in connection with Capital Markets Union that are designed to remove the aforementioned obstacles. In its 2015 action plan, the European Commission published recommendations that mainly related to market-based financing for companies, long-term capital expenditure on infrastructure and improved investment opportunities for retail and institutional investors (European Commission, 2015d; GCEE Annual Report 2015 box 15). However, only three of the European Commission’s 13 legislative proposals have been adopted so far. Firstly, the prospectus rules for securities emissions were updated to make it easier for SMEs to access capital markets. The regulation on European venture capital funds (EuVECA), which aims to promote investment in SMEs and start-ups, and the regulation on European social entrepreneurship funds (EuSEF) were also revised. Finally, a streamlined set of rules for simple, transparent and standardised securitisations (STSS rules) was drawn up that should make it easier for smaller firms to access capital markets indirectly via the securitisation market (European Commission, 2018). (548) In its mid-term review of June 2017, the European Commission stressed the need to “complete” Capital Markets Union and presented a list of priority actions (European Commission, 2017c). These include a more effective supervision by the European Securities and Markets Authority (ESMA), more proportionate regulation to make it easier for SMEs to access organised capital markets, licensing and passporting rights for fintechs and special treatment for sustainable financial products. (549) The large number of different initiatives, some of which are highly technical, makes it clear that Capital Markets Union is fundamentally different from Banking Union. The latter is characterised by a clearly delineated concept for reforming the banking architecture. Capital Markets Union, however, is an ongoing single market project. Measurable success is likely to materialise only in the medium term and it will hardly be possible to trace it back to individual measures. (550) A multitude of further initiatives have been launched in connection with Capital Markets Union. One of the areas in the spotlight is the harmonisation of insolvency law, which includes creating a standardised EU-wide regime for out-of-court procedures. This would avoid lengthy insolvency proceedings, thereby representing a considerable improvement in countries with inefficient legal systems. Other initiatives relate to discharge procedures for individuals and one-man businesses (second chance) and the handling of collateral. Insolvency law is so important because it has a significant influence on capital market-based financing, bank financing and the treatment of non-performing loans. (551) It is also crucial to develop European standards, as has already been done for venture capital funds (EuVECA) and securitisations (STSS). Similar initiatives exist for covered bonds and crowdfunding platforms. These EU initiatives follow the success of earlier standard-setting initiatives such as the creation of the UCITS label for investment funds (GCEE Annual Report 2017 item 503). (552) Another initiative aims to create a pan-European personal pension product (PEPP). The idea is to establish a framework under which different private providers, such as life insurers, banks and asset managers, can develop pension products. The main product features are to be standardised, e.g., in relation to transparency requirements, investment provisions, rules for switching between providers and portability. The existing options for statutory, occupational and private pensions are to be supplemented, not replaced, by the PEPP (European Commission, 2017e). The German Council of Economic Experts (GCEE) has previously supported the creation of a standard product offered by private-sector providers for private and occupational pensions (GCEE Annual Report 2016 item 645). Developing such a product at European level is a step in the right direction as far as the objective of a European capital market is concerned and could boost competition among private-sector providers. (553) In connection with the proposal for a common corporate tax base, suggestions are also being put forward on how to tackle the preferential taxation of debt capital. To this end, it is proposed that a tax allowance be granted for companies that increase their equity. Under the Commission’s proposals, a fixed percentage of the company’s new equity would be tax deductible each year (European Commission, 2018), comprising the risk-free interest rate and a risk premium. This is similar to the concept of allowance for corporate equity, which the GCEE has been proposing for many years (GCEE Annual Report 2017 box 2; GCEE Annual Report 2015 items 728 ff. ; GCEE Annual Report 2012 items 407 ff.). Removing the preferential tax treatment for debt financing could play a significant role in strengthening equity finance in Europe. It would provide incentives for companies to make greater use of equity for funding purposes and would incentivise banks to strengthen their equity ratios. Both of these would make the financial system more resilient. (554) A further proposal is to expand ESMA’s powers in order to achieve a greater centralisation of financial markets supervision. The main advantage would be that regulatory requirements could be implemented more consistently (Sapir et al., 2018), which might accelerate integration of European capital markets. It would also make it easier to tackle the regulatory arbitrage that results from European rules being interpreted more strictly in some countries than in others. Finally, centralising the supervisory authority could produce efficiency gains. Of particular importance is the supervision of central counterparties (CCPs) due to their systemic importance for European capital markets. In some areas, however, national supervisory authorities might have superior knowledge of particular features of their country’s financial market. Country-specific lines of business and products, e.g., Pfandbriefe (covered bonds) in Germany, would therefore need to be able to continue to exist without problems even under a common supervisor. It may therefore be useful to retain some powers at national level. Overall, however, a greater centralisation of financial markets supervision is likely to be a good idea, particularly as Brexit is fast approaching. After all, the EU will lose its financial centre when the United Kingdom leaves. The EU must prevent its capital markets from becoming fragmented due to the formation of multiple financial centres. (555) There are also action plans for fintechs and sustainable finance that are designed to strengthen the future viability of the European financial market. Proposals for exemptions from regulatory capital requirements – as discussed in connection with ‘green finance’ – should be critically scrutinised. Fundamentally, the regulation of equity must be based on the underlying risk of the individual investment and not bound up with political objectives. (556) Overall, it is noticeable that most of the measures planned in connection with Capital Markets Union are aimed at the demand side. Functioning Capital Markets Union, however, also requires investors to be more willing to invest in capital markets products. Given the demographic trend in most EU member states, it would be sensible to further strengthen pension schemes funded by capital. The GCEE has previously proposed various alternative approaches for Germany (GCEE Annual Report 2016 items 650 ff.). Fostering financial literacy in school education could boost investment in European capital markets products, particularly investment funds. However, this is a long-term project that can be managed at European level only to a limited extent. Both private pensions and occupational pension schemes could support capital markets because they create a more important role for pension funds that invest in European capital market products. (557) In conclusion, it is clear that the initiatives planned in connection with Capital Markets Union may contribute significantly to closer financial integration and greater risk sharing in Europe. There must, however, be appropriate regulation to match the growing significance of capital markets. This is especially the case for the rapidly expanding investment fund sector. Regulation in this area is currently aimed, above all, at protecting individual investors and investment funds, not at ensuring the stability of the system as a whole (GCEE Annual Report 2017 items 503 ff.). For this reason, extending macroprudential policy to include the non-banking financial sector should be considered (GCEE Annual Report 2017 item 509). It is important that the long-term nature of Capital Markets Union, based on a patchwork of individual measures, whose impact is only felt over the medium term, does not result in them being kicked into the long grass. In August 2018, for example, European Commissioner Dombrovskis warned that the measures relating to Capital Markets Union could not be completed by 2019 as planned (Brunsden, 2018). Given its huge potential, Capital Markets Union needs to be treated as a high priority at political level. The United Kingdom is home to the City of London, one of the most important financial centres in the world and one that has extensive business links across the EU. The City is particularly important in clearing and derivatives markets. Central counterparties (CCPs) based there are key players in the clearing of euro-denominated transactions such as repurchase agreements (ECB, 2017b). They also handle the majority of over-the-counter credit and interest rate derivatives (OTC derivatives) (Deutsche Bundesbank, 2018). Moreover, about a fifth of the hedging transactions of the non-financial sector of the euro area are carried out in London (ECB, 2017b). When the United Kingdom leaves the EU, UK-based financial market participants are set to lose their passporting rights. These are rights that currently allow banks and financial services firms to provide financial services throughout the EU in cross-border transactions or through branches without having to obtain additional local licences or set up subsidiaries (GCEE Annual Report 2016 box 9). UK-based market participants may be allowed to continue providing selected services in the EU under a third-country equivalence regime, but only if financial market regulation in the United Kingdom is recognised as equivalent. The European Commission takes equivalence decisions unilaterally and may revoke them at any time. A comparison of the provisions for existing third-country regimes shows that the degree to which access to the EU market is restricted varies according to business area. It can therefore be assumed that financial market participants domiciled in the United Kingdom would have only limited access to European markets under a third-country equivalence regime compared to that which they presently enjoy (Lannoo, 2016). The European Commission and the relevant regulatory authorities have repeatedly pointed out that financial market participants should prepare for the UK’s withdrawal from the EU, and should also plan for the possibility that no withdrawal agreement will be concluded (ESMA, 2018; European Commission, 2018b). If the two sides are able to agree on a withdrawal agreement, the planned transitional phase should mitigate the short- and medium-term risks that may result from the UK’s exit. However, such risks cannot be completely excluded (IMF, 2018). In the short term, risks to financial stability could arise from problems relating to the fulfilment of existing contracts. Ensuring the continuity of contracts is of particular importance in the area of derivatives. In principle, existing contracts will remain valid, but lifecycle events for OTC derivatives could imply that existing transactions have to be treated as new transactions, which would then be subject to the new legal framework. In order to carry out these transactions, UK financial services providers would – as a result of Brexit – need an EU equivalence decision, national authorisations or waivers (IMF, 2018). For European clearing participants to be able to continue using UK-based CCPs, these would need to be recognised by ESMA (Bank of England, 2018). Otherwise, European clearing participants and their customers may be forced to transfer their business to recognised CCPs in the EU. Insurers may not be able to exercise their contractual rights and discharge their contractual obligations towards foreign policyholders without local approvals (Bank of England, 2018). In addition, the availability of financial services could be limited by the UK’s withdrawal from the EU. In order to be able to offer their services in the EU despite the loss of passporting rights, banks based in the UK have started to reorganise and obtain the necessary regulatory approvals for subsidiaries in the EU. The need for adjustment varies across the individual transaction types. The impact on activities covered by a third-country equivalence regime will depend on the outcome of the relevant negotiations. For activities that are not subject to regulation (e.g., foreign exchange trading) or that can in principle be provided by non-EU banks (e.g., loans to large companies), the impact is likely to be limited (ECB, 2017b). The withdrawal of the United Kingdom could force asset managers to radically alter parts of their business model. For example, the practice of delegating portfolio management to the UK could be restricted unless the competent national authorities of the EU agree to cooperate with the UK Financial Conduct Authority (Bank of England, 2018). In addition, restrictions on the cross-border marketing of funds are to be expected (European Commission, 2018c). Barriers to the cross-border transfer of personal data could also hamper the provision of financial services (Bank of England, 2018). However, this could be avoided by mutual recognition of data protection rules. Companies can also limit this risk by including clauses in contracts that allow them to transfer data. Given the current status of negotiations, it is very difficult to give a reliable assessment of whether the United Kingdom’s withdrawal from the EU will pose risks to financial stability. The ECB and the Bank of England have formed a working group to deal with risks that may arise in the period around the withdrawal date. The ECB (2017b) does not expect any significant impact on financial stability. Nor does it expect the availability of financial services to deteriorate as a result of the UK’s withdrawal from the EU, although the cost of such services could rise. Depending on the nature of the future relationship, the departure of the United Kingdom could have implications for the financial system beyond the transitional period. The liquidity of financial markets could become fragmented, which would increase the costs of capital market financing. In the area of derivatives, a forced shift to EU-based CCPs could reduce market liquidity and increase transaction costs. Given the prevailing uncertainty, it is vital that the United Kingdom and the EU agree on temporary exemptions that would allow financial market participants access to each other’s markets beyond the exit date, regardless of whether a withdrawal agreement is concluded. These would give the relevant market participants more time to make the necessary adjustments and should limit the impact of Brexit on financial markets. Although the UK has indicated that it may grant exemptions in some areas so that European financial market participants can continue to operate in the United Kingdom, the European Commission has not yet expressed any similar intention. As risks largely result from highly concentrated sovereign exposures, Véron (2017) proposes introducing concentration charges. These should create incentives for greater diversification. The proposal focuses on a bank-specific ratio of its sovereign exposures to its tier 1 capital. If this ratio exceeds the 33 % threshold, the specific sovereign exposures exceeding the threshold are risk-weighted and added to risk-weighted assets (“concentration charge”). The weighting coefficient gradually increases with an increase in the ratio of the sovereign exposures to the bank’s tier 1 capital. For example, a risk weight of 15 % is applied for exposures from 33 % to 50 % of tier 1 capital, and a risk weight of 30 % for exposure ratios from 50 % to 100 %, etc. The key idea is that the concentration charges are based solely on concentration and not on individual sovereign credit ratings. Different variants are also analysed here that include sovereign credit ratings in the calculation of concentration charges. Variant 1 does not include any risk weights for sovereign exposures to member states below 33 % of tier 1 capital. Then half the risk weights under the Basel Credit Risk Standardised Approach are added (10 %, 25 % and 50 %, respectively, for the relevant rating categories). 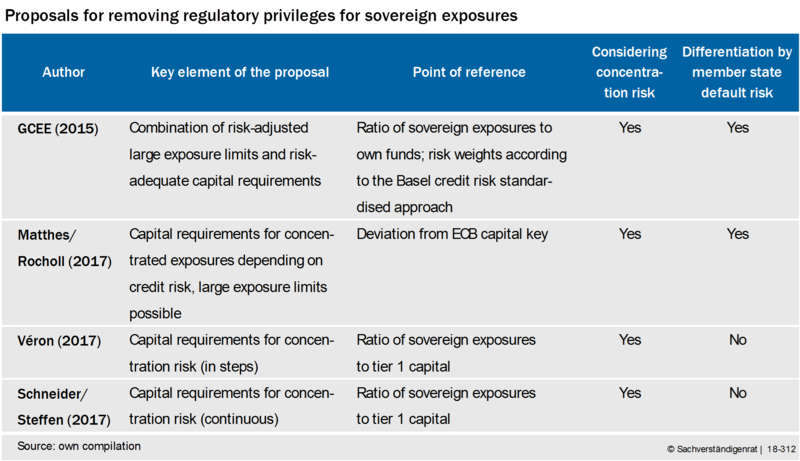 Variant 2 differs from variant 1 only in the use of the full risk weights under the Basel Credit Risk Standardised Approach (i.e., 20 %, 50 % and 100 %). Variant 3 corresponds to variant 2; however it also applies the risk weights for exposures below 33 % of tier 1 capital. Variant 4 is similar to variant 3; however only half the concentration charges in Verón's approach (2017) are applied. Blanchard, O., S. Merler and J. Zettelmeyer (2018), How worried should we be about an Italian debt crisis?, http://bruegel.org/2018/05/how-worried-should-we-be-about-an-italian-debt-crisis/, retrieved 18 September 2018. Giovannini, A., P. Hartmann, A. Popov and J. Imbs (2018), Financial integration, capital market development and risk sharing in the euro area, ECB Discussion Paper, European Central Bank, Frankfurt am Main, forthcoming. Gros, D. (2018), Italian risk spreads: fiscal versus redenomination risk, https://voxeu.org/article/italian-risk-spreads-fiscal-versus-redenomination-risk, retrieved 29 August 2018. Reuters (2018), Scholz - Mangelnde Größe der Banken ist ein Problem, https://de.reuters.com/article/deutschland-finanzministerium-idDEKCN1LF0R9, retrieved 24 October 2018. Schnabel, I. and C. Seckinger (2018), Foreign banks, financial crises and economic growth in Europe, Discussion Paper, University of Bonn. Schnabel, I. and N. Véron (2018), Breaking the stalemate on European deposit insurance, https://voxeu.org/article/breaking-stalemate-european-deposit-insurance, retrieved 7 April 2018. Tabellini, G. (2018), Risk sharing and market discipline: finding the right mix, https://voxeu.org/article/risk-sharing-and-market-discipline-finding-right-mix, retrieved 19 September 2018. Valiante, D. (2016), Europe’s untapped capital market, https://voxeu.org/article/capital-market-union-europe, retrieved 4 October 2018. Please update your Browser to view this website properly. You will need at least Internet Explorer 11 to see our interactive charts. We can't provide users of Microsoft Edge with dynamically generated PNG-files due to technical reasons. We're working on a provision of such files for future implementations. Microsoft Office 2016 (with current updates) or Microsoft Office 365 are able to process SVG-files. Mozilla Firefox or alternatively Google Chrome to achieve the best experience. Unfortunately we can't provide users of Internet Explorer with dynamically generated PNG-files. Most of our charts are interactive, allowing you to scale and rearrange the underlying data to your liking in abundant ways. You can access additional data by hovering the mouse cursor over various data points/areas. You can zoom in and out within most interactive charts. This way you can reduce the density of data and achieve higher readability for specific areas. To do this, you only need to "drag" a line (drag & drop) between the start and end of the area you want to zoom into. By following a strict horizontal line when zooming, you will keep the full height of the chart and only create a subset of the x-axis. This applies accordingly to the y-axis via a strict vertical line. By dragging diagonally you can zoom into a rectangle-area subset of the chart. You can reset the zoom state by clicking on the -symbol. You can isolate chart-data if a legend is displayed. By clicking on a legend item you can hide the corresponding data visualizations in the chart. Double-clicking would isolate this specific data instead and hide all of the other data visualizations. Another double-click on the isolated legend item will restore the original view. Images in PNG-format (not available for Internet Explorer or Microsoft Edge) and SVG-format are available for every interactive chart. If zoom and area selections are made or legend items are isolated, the downloadable image will be generated according to these settings. Axes and annotations that are bound to hidden data should disappear from generated images as well. A CSV-file (spreadsheet) including the respective data is available for every interactive chart. Mozilla Firefox or alternatively Google Chrome to achieve the best experience and full feature-compatibility.